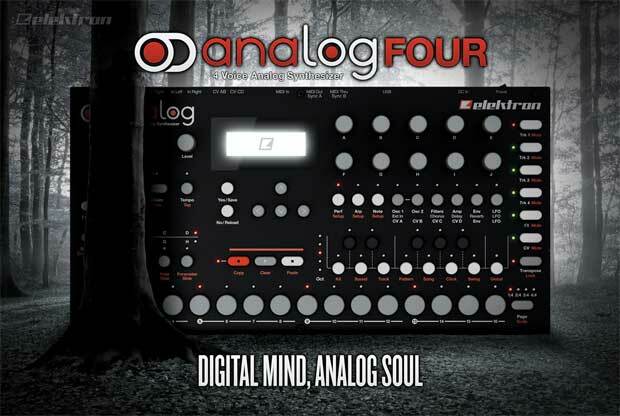 You can finally get a good look at the new Elektron Analog Four. Below are some early (unofficial, but very likely) specs for the new beast, which is said to start shipping on December 3rd. 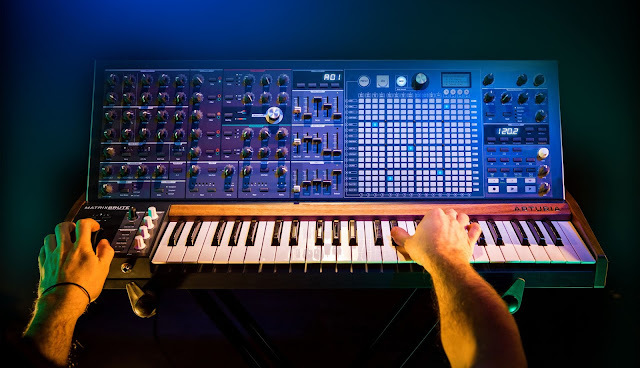 While some of you may initially say this looks similar to the DSI Tetra, it certainly seems to have its own set of extra features (which also makes me think it will hover right around the other Elektron price points at $1100-$1200). Some of Four's unique features include 2 filters per voice, "hi-quality" effects, and an easy to use sequencer. Looking at the image closely, we can see knobs that are lettered (my guess is these can be mapped), the step sequencer across the bottom, 303-key like buttons on the right side, with synth parameters above them (Osc 1 and 2, LFO, etc). Below the screen seems to be 4 directional buttons for navigating the software, with Stop, Play, and Record below that. From what I can tell so far, the Analog Four seems to fit perfectly with what we expect from Elektron-- the black box, buttons, screen, and colors all remind me of the Octatrack. Elektron products are known to have complex software abilities under the hood, so be on the lookout for that as well. 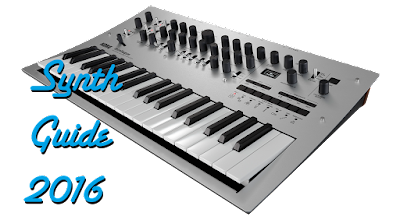 I'm really hoping that the software controls on this synth make it an instant classic. It's fallen nicely into my "analog renaissance" prediction, too! Keep updated by checking Tradition and Future Website, or Elektron's website. Also, check back here for non-official information, previews, and more. 2 Analog oscillators per voice. 2 Analog filters per voice. 1 Analog overdrive circuit per voice. Multiple LFOs and envelopes per voice. Elektron step sequencer with parameter locks. Dedicated CV/Gate and FX sequencer tracks. Estimated shipping date: December 3"